A controversial regulation to update the nutrition facts label that is part of the first lady’s Let’s Move push was finalized by the Food and Drug Administration on Friday, and scientists are warning the new label is not based on sound science. The changes to the nutrition facts label, which first lady Michelle Obama will announce Friday when she speaks at the Let’s Move-aligned Partnership for a Healthier America, requires food manufacturers to list added sugars, which scientists say lacks "scientific rigor." The label will also cost companies at least $640 million to update, and a net social cost of $1.4 billion. "I am thrilled that the FDA has finalized a new and improved Nutrition Facts label that will be on food products nationwide," Mrs. Obama said in a statement. "This is going to make a real difference in providing families across the country the information they need to make healthy choices." In her remarks, Mrs. Obama called the added sugar change to the label the "most important of all." The regulation requires calorie amounts to be larger, and companies will have two years to begin including "added sugars" in order to "help consumers know how much sugar is added to the product during the processing of foods," the White House said. A letter critical of the new label signed by a dozen scientists, including Roger Clemens, a member of the 2010 Dietary Guidelines Advisory Committee, and Eric A. Decker, the head of the Department of Food Science at the University of Massachusetts, was submitted to the Office of Management and Budget. The scientists said the new label is "misleading," and note that it was based on the 2015 Dietary Guidelines, whose committee did not include a single expert on sugars. "We are concerned that U.S. public health policy in this area may be progressing down a path that history suggests to be counterproductive," the scientists wrote. "Specifically, the FDA’s proposed rule revising the Nutrition Facts Label with regard to an added sugars declaration and the establishment of a dietary reference value (DRV) of 10 percent lacks both the scientific rigor based on careful consideration or evidence-based reviews and a thorough appraisal of unintended consequences that will surely arise." "The FDA has stated its proposals are based on conclusions from the 2015 Dietary Guidelines Advisory Committee (2015 DGAC)," they said. "In addition to the widely controversial nature of its report, it is critical to note that this committee did not include a single member with a specific expertise in sugars (or any carbohydrate) metabolism. As nutrition scientists and health professionals, we feel this is of significant concern." The letter also noted that the Institute of Medicine and the European Food Safety Authority have "concluded that added sugars are not uniquely linked to obesity, cardiovascular disease, or diabetes." "Given that the FDA’s proposal regarding added sugars intake as a causal factor in certain health outcomes differs from previous authoritative evidence-based recommendations, it is of utmost importance that the Agency revisit its proposed rule and the scientific process used to make certain that the preponderance of high-quality scientific evidence is considered," the scientists said. "As nutrition scientists and health professionals (many with special expertise in carbohydrates), this rule as proposed would not only be misleading to consumers but also may be a disservice to public health if finalized before the underlying science is appropriately evaluated and considered." Additionally, a study of the costs of the regulation submitted to OMB found that the FDA’s analysis of the benefits of the new label is "deeply flawed." The cost benefit analysis was commissioned by the American Bakers Association, the Corn Refiners Association, the Grocery Manufacturers Association, the International Dairy Foods Association, and the Sugar Association. The analysis found that the government’s estimate of benefits from the nutrition label is "at least 300 times higher than it should be." "This analysis shows that where FDA estimated the benefits of the proposed rules at $31.4 billion (net benefit $29.1 billion), the proposed rules will, in fact, have a net cost of no less than $640 million," according to the report. "A sensitivity analysis examining these assumptions indicate that the net benefits might be as low as $1.8 billion, with a net social cost of $1.4 billion." The analysis also found that the new label will do nothing to make it easier for Americans to understand what they are eating, and may even be more confusing. "The Agency postulates that the revised labels reduce uncertainty about the underlying nutrient amounts in foods, based on the most recent science," the study said. "No evidence is presented to show that these assumptions are true, or that the proposed changes will in any way impact consumers’ ability to understand what is in their food." "In fact, the recommended label changes may very well confuse consumers–particularly those who use the current labels–and lead them to make suboptimal decisions," the report said. The new label is a result of the first lady’s anti-obesity campaign, which has already caused problems for school lunches, and banned Frosted Flakes and other foods in daycares. Mrs. Obama has used the Partnership for a Healthier America Summit, which began Friday, to announce her Let’s Move efforts before. The nonprofit was founded in 2010 in conjunction with Mrs. Obama’s anti-obesity campaign. 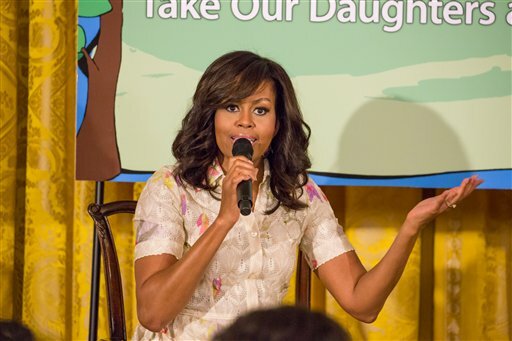 Last year the first lady used the event to highlight "FNV," a marketing campaign using celebrities to try to convince kids that fruits and vegetables are cool.